Ontario seed corn acreage was down this year, at about 15,000 acres, according to Chris Nanni, administrative manager of the Seed Corn Growers of Ontario. Herbicide application across seed corn inbreds; each row of corn is a different inbred. Last year Ontario producers planted about 17,500 acres, but a few years ago acreage reached a peak of 33,000 acres in the province. It’s partly due to that level of production that acres are down now, according to Nanni. “Low prices with lots of seed in the larder, so to speak, leads to decreased acres,” he says. No crop is without its problems, whether those are related to weather, markets or agronomics, but things have never looked better for seed corn producers in Ontario. Despite provincial restrictions on the use of neonicotinoids, seed corn producers can still use these insecticides due to the crop’s sensitivity to pest pressure, according to Nanni. Historically, it’s weed pressure that’s troubled seed corn producers due to the lack of herbicides registered on the crop, but research is gradually overcoming this problem. Robert Nurse is an Agriculture and Agri-Food Canada weed scientist based at the Harrow Research and Development Centre. He’s been involved with annual herbicide registration trials for seed corn since 2006. Nurse’s program is aimed at increasing the number of options, and it’s been successful. Since 2006, eight new herbicides have been registered for seed corn production: Converge for pre-emergence; Callisto for pre-emergence and post-emergence; Lumax; Peak Plus; Pardner; Shieldex; Impact; and Permit. “And we currently have about three or four others that are about to go in for registration,” Nurse says. Seed corn inbreds are more sensitive to herbicides than typical corn hybrids, says Nurse, so herbicides must be screened to prevent injury. Nurse’s program accepts up to 24 distinct inbreds per company annually from seed corn companies in Canada. Even though Nurse only tests inbreds from a couple of companies, several companies fund his research. This system works for everyone – even those companies not submitting inbreds – because, quite often, the knowledge and registrations Nurse’s program generates is useful to these companies because their inbreds will react the same way. 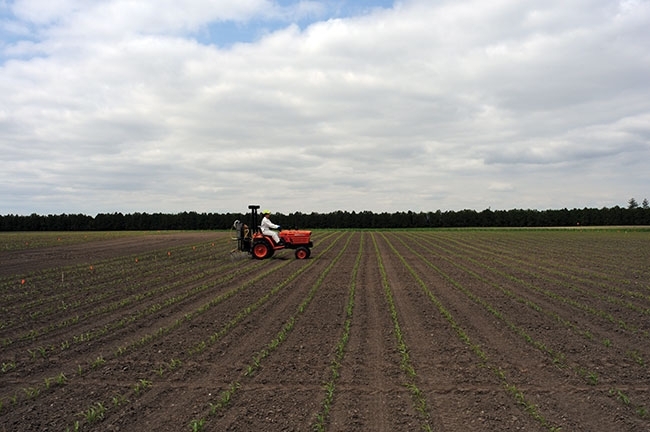 Once planted, Nurse’s team screens each inbred for herbicide injury, poor emergence, bleaching, leaf burn, stunting and reductions in yield after treatment. 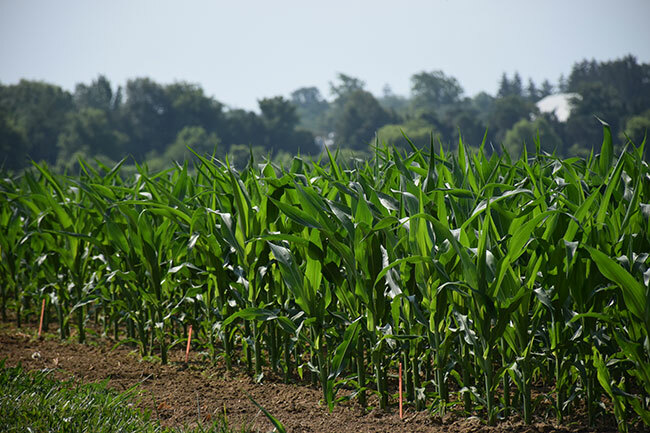 Nurse says that, so far, he and his colleagues have observed that the majority of herbicides registered in field corn can be tested in seed corn inbreds and are safe to use. There are some exceptions, particularly with Group 4 growth regulators such as 2-4,D or Banvel, which can cause severe injury in seed corn. “We also see a lot of bleaching from the HPPD herbicides such as Callisto and Converge, but at the doses we’re applying, the corn is able to grow out of it quickly enough that it doesn’t cause a yield reduction. So the benefit in weed control outweighs the risk of injury,” he says. Nurse says that new weed problems pop up all the time – for example, the spread of glyphosate-resistant weeds in the province. One of the biggest weed problems facing seed corn growers is crabgrass. Large crabgrass has been found in Ontario. But Nurse’s program has improved the herbicide options (Converge, Callisto for post-emergence and Impact are some examples) against large crabgrass for seed corn producers. Producers should take an integrated weed management approach to tackling weed pressure in seed corn, says Nurse, which includes herbicide use along with early season tillage, the use of cover crops and diversified rotations. Nurse suggests tackling weeds with a pre-emergent herbicide while they’re small so they’re not competing with the seed corn crop, and follow that up with post-emergent herbicides later in the season if there are any escapes. He stresses producers should practice herbicide rotation and tank-mixing whenever possible to prolong their use and slow the development of herbicide resistance.